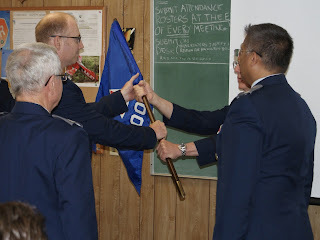 In a ceremony held on 24 June 2016 CAP-USAF completed a three year transition from the Air Education and Training Command (AETC) to Air Combat Command (ACC), where CAP-USAF is now a component of 1st Air Force. 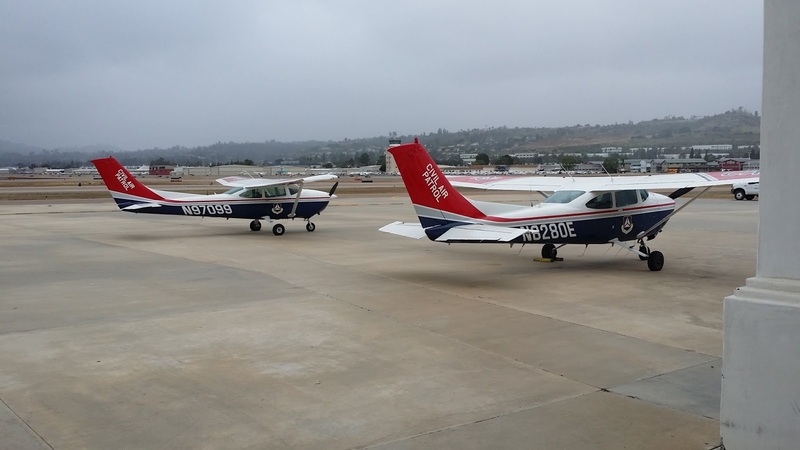 "Civil Air Patrol is an important aerospace education organization, but it's also a vital part of the operational Total Force," said Lt. Gen. William Etter, commander of Continental U.S. NORAD Region-1st Air Force (Air Forces Northern). "Volunteer Civil Air Patrol pilots and aircraft, operating in an Air Force Auxiliary capacity, already fly thousands of sorties every year in support of civil authorities and Homeland Defense, so I'm pleased to officially welcome them to the First Air Force and Air Forces Northern team today." Offers guidance and support to CAP organizations for homeland security and humanitarian missions for communities, states, and the nation. Provides assistance and oversight on search and rescue, disaster relief, and other emergencies and contingencies nationwide. Helps develop the country's youth through training, education, and professionalism. Educates citizens on the importance of air and space power. Personnel serve as the primary functional interface between other federal agencies and the CAP. Serves as the Air Force program office for the Cooperative Agreement and Statement of Work. The CAP-USAF/CC is the program manager. Serves as the only active-duty flying unit at Maxwell AFB and the only operational unit in Air University. Manages the CAP Reserve Assistance Program (CAPRAP) - the largest Air Force Reserve program in Air University. For more information on the realignment of CAP-USAF to 1st Air Force click on the FAQ page. A 1st Lieutenant commanding a squadron of Captains and Majors? A Lieutenant Colonel reporting to (and saluting) a Captain? While situations like this generally do not happen in the U.S. Air Force, this is actually pretty common in Civil Air Patrol. The reason why is embedded in our organizational structure and the reality that CAP is composed of professional volunteers. As the U.S. Air Force Auxiliary, the Airmen of Civil Air Patrol are privileged and proud to use the Air Force system of grades for officers and NCOs. 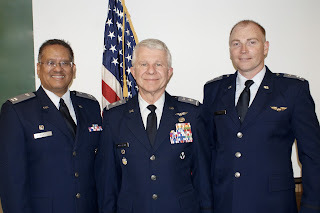 In order to distinguish CAP members from USAF personnel, CAP officers wear their grade on grey epaulet sleeves. 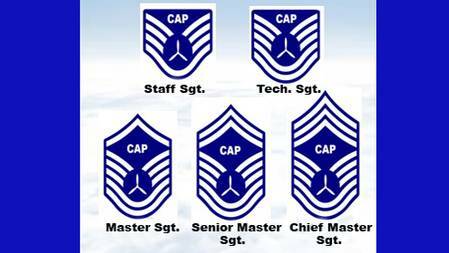 CAP NCO's wear sleeve grades, with CAP distinctive markings to differentiate CAP members from Air Force NCOs. In this post we will focus more on CAP officer grades, as the NCO program is currently reserved for prior (or current) service military NCOs only and the majority of CAP members are Officers. In Civil Air Patrol the grade that a member wears on his/her uniform has more to do with their progression in the CAP Professional Development (PD) program, and their time of service in CAP, than it is a symbol of authority and command, as it is in the Air Force. The CAP Professional Development (PD) program encompasses five "Levels" and promotions are tied into a member's progression through the PD program. For example-to become a 2nd Lieutenant a member must complete Level One of the CAP Professional Development program and serve for at least six months as a "senior member without grade." To achieve a promotion to Captain a member must be a 1st Lieutenant (or Senior Flight Officer) for at least 30 months and complete Level Two of the Professional Development program. To become a Major a member needs to complete Level Three, and to become a Lieutenant Colonel a member must complete Level Four. Level Five is the highest progression in the PD program and completion of this level is required for members desiring certain command positions. There is no minimum grade requirement that a member has to be to assume most positions of command-which is why a 1st Lieutenant can command a squadron with Majors and Lieutenant Colonels that are members. Of course, this doesn't mean that anyone can be a squadron commander-the commander must be approved and appointed by the commander of the next higher level! So who do I salute? As you can imagine, this can be confusing at first for someone with military experience who is used to the commanding officer being the most senior member in the room! So, how does this all work in CAP? Generally, the junior officer salutes the higher ranking officer. Therefore, if a Captain, who is a squadron commander approaches a Major outdoors, the Captain will initiate the salute as a courtesy to the Major, even though the Captain has command authority over the Major. The exception to this is if the Major is formally reporting to the Captain, i.e. during a promotion/awards ceremony. In this instance the Major would initiate the salute to the Captain both when reporting and when dismissed. As we have mentioned before, authority in CAP is tied into the position that one holds and not the insignia on the shoulders or sleeves. This is why a Lieutenant Colonel will defer to the Captain who is a squadron commander during a meeting, or while serving on an aircrew or during a mission. It is this culture of mutual respect and courtesy that enables CAP members to successfully interact with each other, in instances that may be a little different from our parent service, so that we can focus on the missions that we have been tasked to do. I know that this is really touching the "tip of the iceburg" on the subject of Customs and Courtesies and developing a culture of mutual respect-so if you're interested in this subject we recommend this publication from Civil Air Patrol. 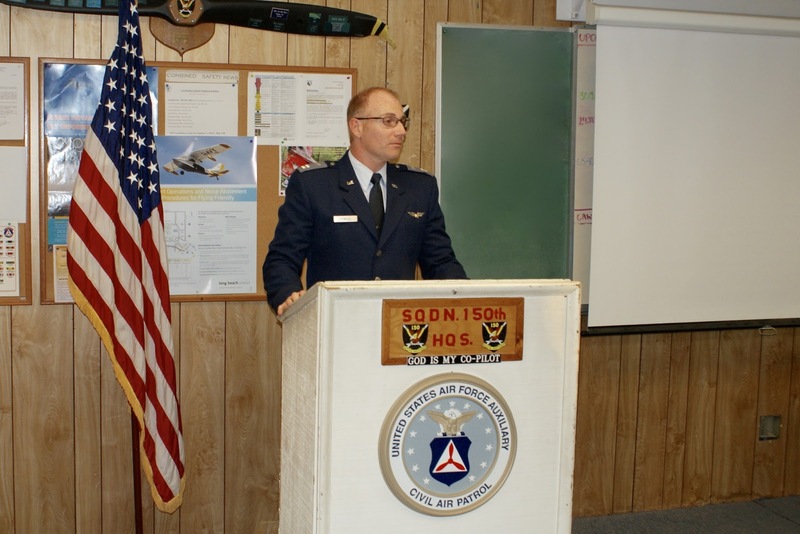 Long Beach Senior Squadron 150 announced the promotion of Senior Member Stewart Davis to the grade of Captain in a ceremony held on 26 May, 2016 at Squadron 150 Headquarters on Los Alamitos Joint Forces Training Base. Capt. Davis joined Civil Air Patrol in September 2015 and served in a squadron in Louisiana before transferring to Squadron 150 in November 2015 when he relocated to Southern California. He currently serves as the Squadron's Aerospace Education Officer. When asked what motivated him to join CAP, Capt. Davis said, "Being a civil pilot and a long time reservist at home I thought it might be interesting." He looks to pursue Ground Team qualifications in CAP, perhaps log some time in gliders and continue in his role in Aerospace Education. A native of Australia, Capt. Davis is a Major in the Australian Army Aviation Corps and is currently assigned to the Australian Army Standby Reserve. Capt. Davis earned a private pilot license in 1985 and his commercial helicopter license in 1987 and in 1998 he earned a Commercial Aeroplane Licence, Multi Engine and with an Instrument Rating. In 2000 he earned an Air Transport Licence, Helicopters and an Instructor rating as well. He has flown a wide variety of aircraft including Cessna 150/152, 172, 172 RG, Piper Cherokee, Arrow, Lance, Seminole, Twin Comanche and Apache, Beech Duchess and Baron. Helicopters are: H269 and H369, Bell 206 B and L, Robinson R22 and R44; Bell 212/412 and 214ST; Sikorsky S76 A/A+/A++/C++/D and the S92A. He is currently the Assistant Director of Flight Training for a national provider of aviation training. We congratulate Capt. Davis on his promotion and thank him for his service to Civil Air Patrol and Squadron 150. UPDATE: Registration for the SAREX is now complete and all positions have been filled. 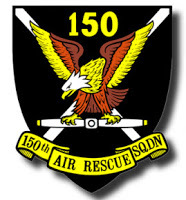 Continuing our role as one of the leading squadrons in California Wing (yes, we're a little biased), Squadron 150 is currently in the process of planning a Search and Rescue Training Exercise (SAREX) for South Coast Group 7* members on 18 June-19 June, 2016 to be held at KFUL, Fullerton Airport at the Squadron 40 HQ. Capt. Bodo Rau, Squadron 150's Director of Operations, is the lead Project Officer for this SAREX and has been working with his team to ensure this training exercise's success. Capt. Rau said, "This exercise shall provide training opportunities to mint new aircrews and base personnel (and) also to provide recurring and proficiency training for current aircrew members." The SAREX will consist of qualification and proficiency training for aircrew and ground-based personnel, through a simulated search and rescue mission under real world conditions. The current plan is for air sorties to be flown on both Saturday and Sunday, providing CAP Airmen with valuable training opportunities. Base personnel will maintain communications with all aircraft and obtain status reports from all air crews, as well as conduct all necessary activities related to a search and rescue mission. *At this time participation priority is given to Group 7 members, however interested members from other groups are invited to contact Capt. Rau for more information. Capt. David Powell assumed command of Civil Air Patrol Long Beach Senior Squadron 150 from Capt. Lloyd Bumanglag in a change of command ceremony held on 2 June, 2016 at Squadron 150 Headquarters on Los Alamitos Joint Forces Training Base, California. South Coast Group 7 Deputy Commander Lt. Col. Jim Robertson presided over the time-honored ceremony signifying the transfer of authority from one commander to another, as he received the unit guidon from Capt. Bumanglag, who relinquished command, and handed it to Capt. Powell who assumed command of Squadron 150. Capt. Powell joined Civil Air Patrol in 2014, out of a desire to serve his community and because of his interest in aviation. A licensed pilot, Capt. Powell is an aircrew Mission Observer and is also qualified as a Mission Radio Operator, and Mission Staff Assistant. Capt. Powell was appointed the squadron’s Deputy Commander in January 2015 and has also served as the Squadron's Finance Officer. Outgoing Commander Capt. Bumanglag will be assuming new duties at the Group level and will be serving as the South Coast Group 7 Professional Development Officer in addition to working on several projects assigned by California Wing. Capt. Bumanglag has been a member of CAP since 2008 and has held positions such as Public Affairs Officer, Professional Development Offficer, along with serving as Unit Commander. The Airmen of Squadron 150 thank Capt. Bumanglag for his service and wish him the best in his future role at South Coast Group 7 and we congratulate Capt. Powell on his new command and wish him Semper Vigilans! There will be Change of Command ceremony tonight (2 June, 2016) at Squadron 150 Headquarters. The ceremony begins at 1900 and we recommend you arrive early to be prepared for the start of the ceremony. If you are interested in visiting our Squadron, we invite you to attend our meeting next week on 9 June from 1930-2100 at our HQ in Los Alamitos JFTB. We look forward to seeing you next week. Squadron members and guests, please join us in offering our thanks to the outgoing Commander Capt. Lloyd Bumanglag, and in welcoming our new Commander, Capt. David Powell.